"One of Mortal Kombat's infamous boss characters will be out as a pre-order bonus for MKX"
Warner Bros. and Netherrealm Studios have announced the release date for Mortal Kombat X today. Netherrealm fighters tend to be released sometime in April and MKX is no exception. The Playstation 4, Xbox One, Xbox 360, Playstation 3 and PC versions of Mortal Kombat X will be out on April 14, 2015. The pre-order bonus was also announced today, which is Goro. Fans are usually not thrilled with fighting game characters as pre-order bonuses because these are the types of things you expect to be out day one without needing to reserve. In the tournament scene, these characters or console exclusive characters are banned till they are out for everyone. Hopefully we won't have to wait a long time after the game's release when Goro comes out for everyone. 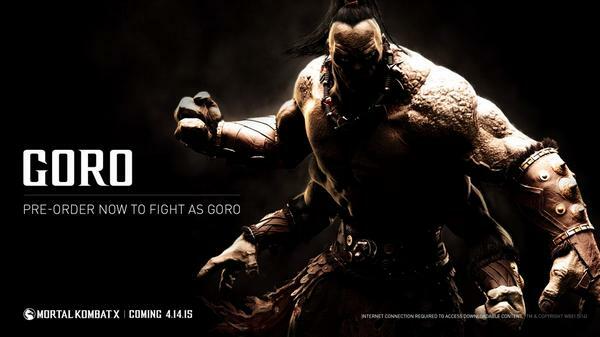 Mortal Kombat X comes out on April 14, 2015 for the PS4, Xbox One, PS3, Xbox 360, and PC.